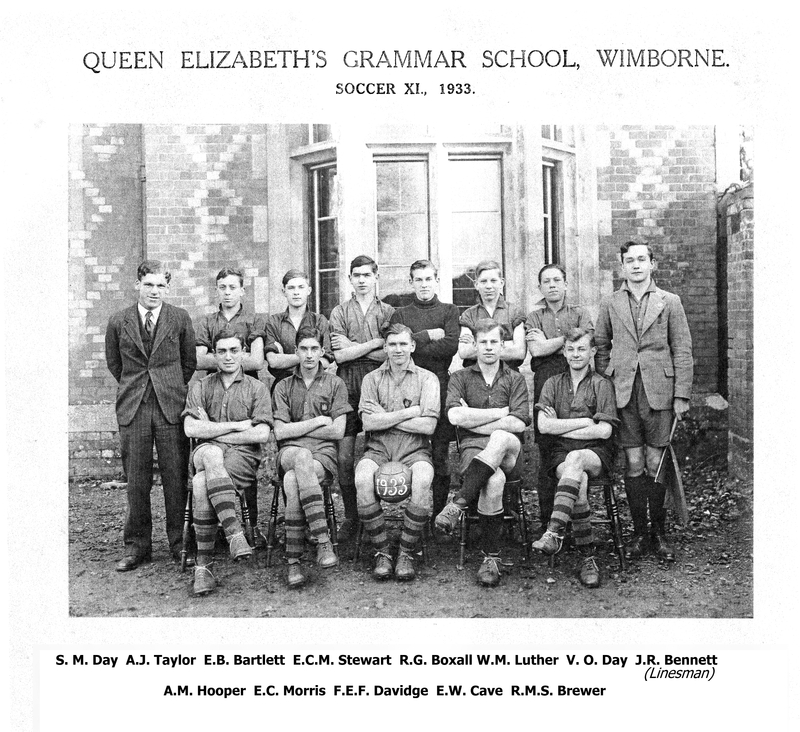 E C M “Ted” Stewart first appears in the Winburnian no 66 winter 1934 as a batsman scoring 37 for school v. Old Winburnians, but we have a photo of him in the 1933 soccer team, where he is the 4th from left back row. He then gets his “colours” as full back in the rugger team, as well as being promoted NCO in the Army Cadet Force. He must have left at the end of 1935, and his address is given in Ferndown. Some years elapse, and in 1939 we read that he has joined the RAF, and his progress is reported, OW mag 88 Pilot Officer Instructor. By 1944 he is in India with the rank of Flight Lieutenant, and later is promoted to Squadron Leader. In 1945 he sent Christmas Greetings to the magazine. Number 100 has the interesting note that the school is grateful to Mrs Stewart for the gift of old rugger and soccer shirts, which are in very short supply. Finally in no. 102 he has returned to Ferndown, after long service flying, among other aircraft, Mosquitoes in the Burma campaign. We are all familiar with the Stewart Garden Centres in Christchurch and Broomhill, which are descended from the Nursery business the Stewart family had built up from the mid-1800's in Ferndown. What we don't realise until we read the history of that firm, is that, under the management of Ted, it introduced into this country the selling of plants grown in containers. Until that time, new plants were grown in the ground. Nurseries only had income from October to March. Ted had been interested in seeing what the industry was doing in America. As a pilot, he was keen to do some flying there. What better way to go about research than by flying himself all around the country and Canada. He phoned his sisters from Toronto in 1953 to say he had seen the future and it was called “Garden Centres”. In these centres plants were sold in pots and containers and there was public enthusiasm for visiting out of town establishments with plenty of parking from which they could take home plants in their cars. On his return they adapted sheds at Ferndown to sell plants in pots in 1955, but this was the forerunner of the first purpose-built Garden Lands at Christchurch opened in October 1961. An article in the Sunday Times (28th May 1972) acknowledges that it was Edward Stewart ( only son of A F Martin Stewart ) who should be credited with this initiative. Now they are all over the country, and perhaps we can take some satisfaction that the introduction is down to an OW! The present Managing Director, Martin Stewart, his son, reports that he definitely had an affection for the school and talked about it often. I am grateful to him for his help in producing this account.